It is the end of June and I feel like I’ve done nothing. I’m looking at the start of July and behind it looms August. I feel like I’ve done nothing since the end of the spring semester. I know that is not true, but it is hard to think otherwise. So few projects in academic life can be measured in easily checkmark-able lists of completion; frustration becomes an easy feeling to encounter. I’ve been to 2 conferences and cobbled together the associated papers for each. I wrote a proposal for a third, doing the required research to cobble that together. I revamped my CV. I rewrote one version of my job letter, a work in progress, but I’ve used it once already. I applied for a few other jobs and some adjunct work. I applied for two Alt Ac jobs, one of them at a zoo! I wrote new cover letters for those positions and reworked my CV into something that looks sort of like a resume. FYI: Applying to a zoo makes for a wonderful icebreaker at a conference. I’ve revamped my auto-generated emails about jobs from some of the academic job websites. I revised an article that I’m working on. Revised and revised. Sent it to some peers. I need to keep revising. I’ve tinkered with a second article for revision. I read a book cover to cover. I’m almost done with another book. I feel like I’ve not really read in a long time. I think I read some journal articles, but I can’t remember. I’ve printed out articles to read. And I will read them. I spent a day at the Moravian Archives. I spent some time downloading various programs and fiddling with learning code. I’ve fiddled with learning German and trying to figure out how to read gothic German script. I’ve looked at databases. I’ve figured out how to access databases on the sly. I’ve tweeted and written blog posts. I’ve thought about what I’ll do in my class this fall. Just one. At the moment. I’m not going to plan it out until I know that I’m actually going to do it. I’ve networked. And as a result of such networking, I’ve brainstormed a Twitter project on Harriet Beecher Stowe and started a soft rolling out of it. I inquired about the need for a new Stowe bibliography. I’ve corresponded with a friend about staring an American lit pedagogy blog. I’ve thought about the fact I’m not being paid to do any of the things listed above. Rationally, having listed the above academic work out, I feel a little bit better. Not really. I wish the work we did provided more ocular proof of a path to completion. I wish there was a greater sense of working to a goal being apparent. I wish academic work was like clearing brush. I wanted to write a post reflecting on my recent visit to the Moravian Archives in Bethlehem. However, I was unsure what exactly to write about in such a post. One part of me wanted to write an excited and rambling post about all of the cool things that I had a chance to look at during my visit. Another part of me wanted to write about some of the answers that I found since writing my original post on the plaque on Bethlehem’s Old Chapel. However, part of me didn’t want to write anything, not because I didn’t have anything to say, but because I’d like to eventually publish a piece about the Old Chapel’s plaque and the girls’ boarding school in Bethlehem. Of course, that need to publish is important, especially for an early career scholar like me. However, I’m unsure about how to balance that publication need with writing about my research in progress in a personal blog. I think sharing one’s work is very important for many reasons. First, it gives a public face to the work that we do. Second, writing in a blog provides an opportunity to write publicly and safely experiment with form and voice. Third, and more personally, I do my best thinking when I can think over a topic by writing. I have to think long and hard about my ideas, and I obtain the best results by writing about them and then thinking about them some more. All that being said, my plan is to formally write up the results of my work. I do have a venue in mind, one that is online, open-access, and also peer-reviewed. My current project would fit well with that venue, I think, and, it also provides a public face to scholarship in an innovative forum, which I believe is not only valuable, but important, too. Note: I did write a substantially longer post about what I found in the archives. In light of the above issues, I’ll provide the tl;dr version. 1. Tom McCullough, the assistant archivist at the Moravian Archives was beyond helpful. He took the time to translate an important passage for me. He didn’t have to do that. You can read a profile of him here. 2. Yes, I saw awesome stuff. 3. Yes, there is an archival record of the event at the Old Chapel. 4. Yes, there is a world of poetry beyond the event at the Old Chapel worth exploring in relation to the Female Seminary. 5. Yes, there is a world of poetry worth exploring beyond the Seminary and it includes the boys’ school in Nazareth (with their several boxes of poetry) and in the larger community in Moravian Bethlehem (with their several boxes of poetry). *Sort of. I’ll write more in a follow up post. I might get into some more specifics of my visit to the archives, but for now I’m going to hold back and see where my research takes me. Now, you likely never heard of the phrase “performative y’all” since it is a concept conceived by my partner in a passing discussion that we had a long time ago. The performative y’all occurs when y’all is used devoid of any cultural context and employed as an attention grabbing marker to highlight the importance of content to follow. In essence, the performative y’all is used as a short-hand form of “hey, everybody, listen up to what is going to follow” or “hey, everybody, look at this.” This use of the performative y’all appears to have grown out of the need to meet Twitter’s character limit. However, my partner identified the use of the performative y’all well before either of us became active users of Twitter. Yes, the performative y’all can be seen habituating Twitter, but my partner first noticed its use in emails and internal listserv messages while we were both in graduate school. I’ve encountered heavy use of y’all on college football Twitter and I’ve never thought twice about it. However, I’ve noticed increasing use of y’all occurring on the academic side of Twitter. On academic Twitter, y’all serves as a way to draw attention to a post, a link, or an idea. The performative y’all, especially on mediums like Twitter, functions as a manicule in word form. It draws attention to the content. It would be an oversimplification to say that y’all used to draw attention to southern foodways or a weird happening in the south is right, but that saying y’all look at my new book publication, or what I found in the archive, or OMG cute puppies would be wrong. I’m not the word police and that isn’t the reason why I am writing about y’all. However, I have a lot of concerns with the use of the performative y’all because using it without any social or cultural context also means that its use is devoid of related negative social and cultural perceptions. In effect, utilizing the performative y’all allows the speaker or writer to escape being thought of as the stereotypical dumb Southerner or having other dispersions cast on one’s background or education. Those of you that know me might be thinking to yourself: Why does Greg Specter care? He isn’t from the South. I believe that the grief one gets for using y’all isn’t about the city listed on one’s birth certificate, but rather on the manifestations of markers tying, in my case, one to the South. More on that below. Again, you might be thinking to yourself, surely, Greg Specter, you don’t go around using y’all all over the place. Yes, I do; I say y’all a lot, especially in the classroom. When I began graduate school I had a teaching mentor that used y’all a lot in the classroom setting and in personal interactions with me. I don’t know if this individual came from the South, but they did go to school in the South. Not that going to the school in the South means one is going to have an inherent transfer of Southern-ness. Point is my first mentor used it a lot. Like many early-career instructors, I borrowed a lot from this individual and y’all was part of those borrowings. While the above case certainly influenced my use of y’all, my other exposure to y’all is much more personal. My long-term partner comes from the South. They use y’all a lot. Spend enough time with someone and you will learn and borrow a great deal from them. An increased use of y’all is one thing that I have received as part of my relationship. I’m sure I’ve picked up other phrases, too. Repeated use of y’all certainly helped. I like to say y’all and especially like to use it in the classroom. I like y’all because it is a gender-neutral plural noun. Y’all demonstrates more personality than saying “all” or “everybody.” Now, my use of y’all occurs in the physical space of the classroom or in email greetings, but it is not something I include in formal documents like assignments and exams. Since returning to Pennsylvania I’ve been called out for my use of y’all in the classroom setting. In some cases, these instances have been lighthearted, but in other cases they have been murmured mocking that I overheard. These reactions are not ones that I ever encountered during my time at the University of Missouri. The first response that someone might have is that these murmurings against my use of y’all are a sign that students don’t respect me, but I don’t think that is the case. I am not willing to buy into that line of thought since I know of instances where friends and colleagues have been mocked or dismissed for using y’all. I don’t think my use of y’all would be a problem if I had received my PhD from a school on the West Coast or in the North East. I think for a many of my students, Missouri, being a thousand miles away from the Lehigh Valley, carries enough weight to mark it—and me—as Southern. Now, Missouri is weird; it doesn’t fit easily into categories of north, south, east, or west; but, folks unfamiliar with the state do not necessarily know that. At some level, Missouri’s history as a slave-holding state, a border state, and its role during the Civil War likely colors the associations many have of the state, but I’m not sure how much. Additionally, I’m unsure if the University of Missouri being in the SEC affects the perception of the state or of me. I don’t get the sense that SEC sports are on the radar for many of my students and the people I encounter. For many of the students that I interact with in the classroom, Missouri is a marker of a connection to the South and it colors my use of y’all. Notice that I did not recount my time in Columbia, Missouri as part of the formative experience in my use of y’all. Columbia, like many college towns, exists in a well-contained bubble that draws in many people without ties to the area. I will continue to use y’all in the classroom. I’ll certainly use y’all outside of the classroom. However, I do wonder: For users of y’all, like me and a few people are judged for using y’all in the classroom, are we judged for using y’all in other professional spaces? Perhaps judged by people who, unburdened by cultural makers, make frequent use of the performative y’all? What is happening in Wisconsin with regards to tenure is disturbing, but I’m more concerned with what the reactions to circumstances in Wisconsin reveal about the expanding discord between individuals on the tenure-track and the vast majority of college-level teachers living off the tenure-track. There is plenty of anecdotal evidence of this conflict to be found on Twitter and on article comment sections. Individuals outside of full-time academic work express feelings of “welcome to my world” when hearing responses from those on the tenure-track reacting to changes in tenure proposed for the University of Wisconsin system. Those with precarious employment might look at tenure-track professors in Wisconsin as hypocrites for never voicing concern about the uncertain economic and employment situations facing their colleagues. Others might feel that folks in Wisconsin should just leave; others would be more than willing to take their vacant jobs. From those on the tenure track there is still a level of dismissiveness towards their adjunct peers: You are not like us; our situation is different from yours. Sadly, many people recognize that the responses from those on the lower-rungs of the academic hierarchy are expressing reactions that are only natural after decades of brewing marginalization. Going forward, if we ever hope to fix the problems facing academia, especially with regards to issues of job security for all, we can’t have this tension and in-fighting existing between involved parties. Regardless of circumstances, we need to advocate for each other. Regardless of circumstances, we need to watch out for each other. We need to be like meerkats. Individuals across the spectrum of academic life could learn a great deal from meerkats. Meerkats live in large matriarchal social groups, known as mobs, consisting of a dominant female, the dominant male and a variety of helpers consisting of offspring and other meerkats that have joined the mob. Meerkats, regardless of their standing within the mob, participate in a variety of roles ranging from babysitting and providing milk for young meerkats, to foraging, grooming, and play. One of the most important roles within the meerkat mob, and the one they are most famous for, is that of sentinel. Standing erect on their hind legs, meerkat sentinels scan the horizon for threats to members of the mob as they forage, care for their young, or rest and relax. At great risk to themselves, a meerkat on sentinel duty might work from ground-level or an available highpoint, like a dirt mount or even a tall tree, scanning the earth and sky for any sign of danger. During this time on sentinel duty the meerkat forgoes foraging for themselves and exposes themselves to the very dangers they are watching for on land and in the sky. In the event of danger, a sentinel will call out to the rest of the group with a warning for them to return to the safety of their burrow or bolt holes. 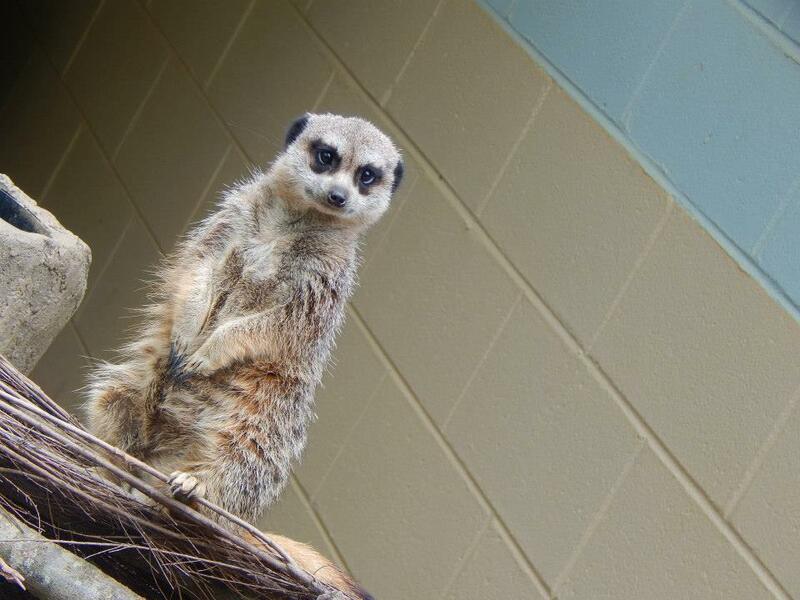 A meerkat at Zoo Atlanta standing watch. At this point, you might be thinking this is a call for academics to be on watch for each other in the face of trying times. Yes, it is call to watch out for each other, but it is a specific call. It is a call to watch out for each other, and like meerkats, to do so regardless of station. Science knows the practical reasons of why meerkat mobs engage in sentinel behavior, but the reasons are less clear at an individual level. There are several theories as to why meerkats engage in sentinel behavior. One theory contends that it is altruistic behavior. Another theory argues it is a way for individuals to increase their prestige within the mob. A different theory argues that it is not altruistic behavior, but is a way of preserving the mob, which, in turn, secures the preservation of the individual. The fact is: Regardless of station or reason, all meerkats engage in sentinel behavior. We in academia need to be like meerkat sentinels. Regardless of our station, regardless of the reasons for guard duty, whether altruistic or out of a need for self-preservation, we need to watch. Find a Grave Editing Marathon: Could it Work? In the process of writing my blog post on the poet Caroline M. Congdon, I came across an entry for her on the website Find a Grave. Congdon’s entry includes nothing more than her name, birth and death dates, and an image of her tombstone. There is no other biographical information about her listed on the site. The sparse nature of Congdon’s entry started me to thinking: Could the model of Wikipedia editing marathons be applied to addressing the scarcity of the historical record with regards to women’s history on Find a Grave? Editing-thons of Wikipedia allowing users to create, add, and curate content have been incorporated into successful scholarly and classroom endeavors, especially in the case of women’s history. Many of these efforts have sought to broaden the exposure and the qualities of entries dedicated to women in the fields of science, the arts, and literature. These editing marathons have provided a way for scholars and classrooms to broaden the way that they connect to a larger public. Of course, these collaborative endeavors are facilitated by Wikipedia’s promotion of collaborative editing, but more on that later on in the post. 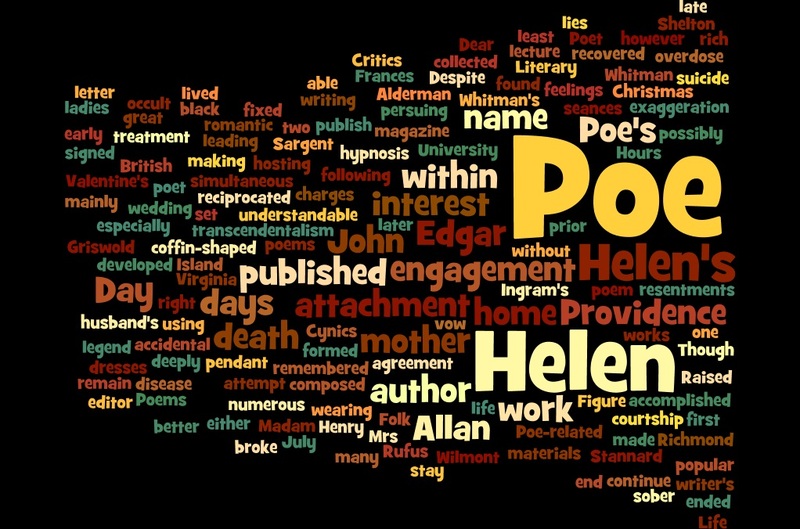 In this Find a Grave entry, Whitman’s fame and her entire life story derives from her relationship with Edgar Allan Poe, not her own merits as a person and a poet. Find a Grave users have their hearts in the right place and appear to genuinely consist of individuals interested in history and genealogy, the preservation of cemetery records, and a commitment to often marginalized and forgotten personal and local histories. However, many Find a Grave biographical entries are sparse when it comes to details, derived from sources like Wikipedia, or contain inaccuracies. Find a Grave seems ripe for an organized exercise in public scholarship similar to the Wikipedia editing marathons; Find a Grave, however, is vastly different than Wikipedia, and a massive editing project could be a difficult undertaking. The content generated on Find a Grave shares some similarities with Wikipedia, namely the investment of the users in the subjects that they write about on the website. Content on Find a Grave is created by users invested in documenting cemeteries and graves across the United States and the world. In large part, that desire to document graves is what drives the creation of entries on Find a Grave, not necessarily biographical or contextual information. Beyond user initiative in creating and maintaining individual records on the site, Find a Grave lacks Wikipedia’s relatively easy and simple collaborative form of editing. Once an entry on Find a Grave is created, any suggested edits must be approved by the user that maintains the particular entry. Editing entries on Find a Grave relies on not only a willing user, but a still active one, too. Find a Grave allows the transfer of individual grave entries from user to user, but such transfers are predicated on specific genealogical criteria. Requesting users must be within a prescribed number of generations in relation to the subject of the entry they request to take over. An organized project of editing entries on Find a Grave could be a significant undertaking, but it is possible that it could work, and it could offer a significant public engagement opportunity between Find a Grave users, historians, and literary scholars. Find a Grave is driven by a community of dedicated users invested in the histories and personal stories of the topics they are write about, and it is possible that passion could translate to a collaborative partnership with those seeking to highlight women’s history on Find a Grave. With the 2014/2015 academic job season coming to a close, I find myself preparing for the next season and keeping my eyes on other options. A proactive step I’ve undertaken is expanding my (mostly) daily job search email from Higher Ed Jobs to report results for regional and national jobs in my field. Additionally, in perusing Alt-Ac jobs, I’ve generated a third automatic search dedicated to ALL jobs in the Lehigh Valley. My regional and national search results, especially at this time of the year, confirm the high number of adjuncting and temporary positions available. Given what we know about the circumstances of academic jobs, especially for the humanities, the results are not surprising and confirm much of what one reads on CHE, IHE, and finds on social media. However, I am surprised by what I’ve seen in the results of my automated searches for academic jobs in the Lehigh Valley. For those of you unfamiliar with the Lehigh Valley: It is an area of Pennsylvania located about an hour northeast of Philadelphia. The major towns of the Lehigh Valley include Allentown, Bethlehem, and Easton. It is a lovely, vibrant area that I’m happy to call home. The Lehigh Valley, given its size, hosts a large number of colleges, universities, and community colleges. It is not uncommon to see my frequent search results from Higher Ed Jobs generating a healthy number of jobs in academia available in the Lehigh Valley. I counted on seeing a variety of adjuncting opportunities across all educational fields in these search results, but I was unprepared for the number of jobs dedicated to low and high level administrative positions, especially of the assistant or associate director nature. Since the expansion of administrative positions in higher education has been well-documented, I wasn’t unaware of the administrative creep occurring in academia. If anything, I wasn’t prepared to see the robust expansion of administrative roles in such a small sample size like the Lehigh Valley. 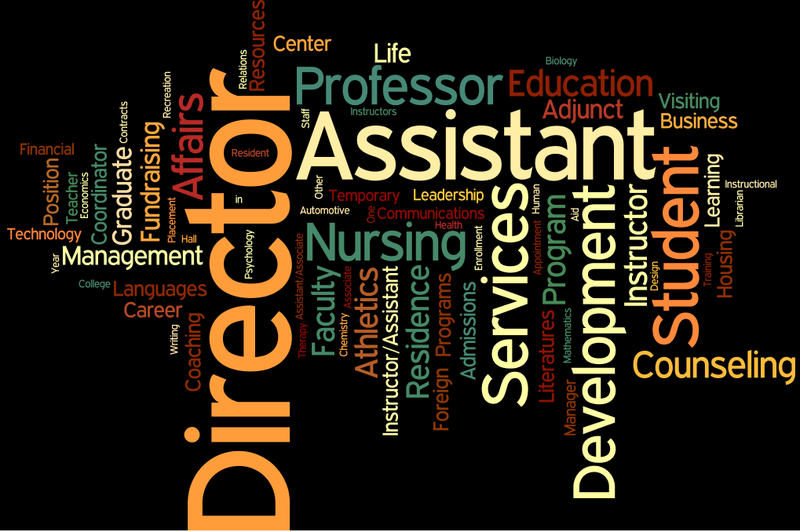 I decided to make a word map as an aid to understanding the academic job scene in the Lehigh Valley. The data used consists of 74 jobs posted in the Allentown / Bethlehem metro area (as defined by Higher Ed Jobs) and dates from 01/26/15 to 06/03/15. I included the advertised position name and its associated classification. I removed all locations, school names, and extraneous words. The results largely confirm the feeling that I’ve had over the past few weeks: I should have done my PhD work in the field of Assistant Director. Joking aside, I find these results disheartening and I’m further saddened to see many of the requirements listed for these positions and their associated salaries. It isn’t uncommon for many of these positions to require a BA and a few years of experience. Furthermore, the salaries are often far beyond what a person with a PhD in the humanities can obtain with full-time employment. It is likely for the best that I cannot easily graph all these advertisements and represent their trends visually. I suspect these results for the Lehigh Valley are likely not different than other comparable areas of the country, and that is the troubling thing. The phrase “pitiful soul-crushing wage-slave job” resonated with me and it made me think a lot about money and the nonsensical nature of the system. In terms of money, creating a PhD, even in the humanities, represents a large monetary investment by a school. What follows are just some estimates of numbers. A student earning a PhD represents a five-year investment of stipends and tution waivers. Roughly in the case of a humanities PhD that might mean 5($25K Tuition Waiver + $15K Stipend + $5 Insurance Benefits) = $225,000. All of that investment and many PhDs are siphoned into a “pitiful soul-crushing wage-slave job” that earns around $3,500 according to some averages floating around. It doesn’t make sense. Thinking about the monetary situation led me think about the lack of agency facing many adjunts. There is a great loss of control when it comes to adjuncting. I think that feeling of loosing control is behind both of the pieces that Harris wrote about the academic system. A loss of control for what? A paltry sum and countless hours invested? Still, I recognize the difficulty of abandoning the system. But I’ve thought about taking control of circumstances today and how on paper that path looks (deceptively) simple. There is more control and more money to be found in foregoing adjuncting and throwing oneself at grants, fellowships, and other monetary awards. Often, the smallest of awards might equal or exceed the money earned from teaching one class over the course of a semester. A small exploratory research grant likely “pays” more than adjuncting. It doesn’t make sense. If anything, as I deal with this gnawing pain in my gut caused by thinking about academic life, I’m struck by the fact that becoming an occasionally successful grant-seeking mercenary would pay more than adjuncting. I know that sounds reductive, but it shows me the broken nature of the system. Anyway, those are my thoughts. They are just a quick recap about ideas I’ve thought about today. Feel free to add your thoughts in the comments.